Changing leaves and cooler weather create inviting conditions for fall hiking. 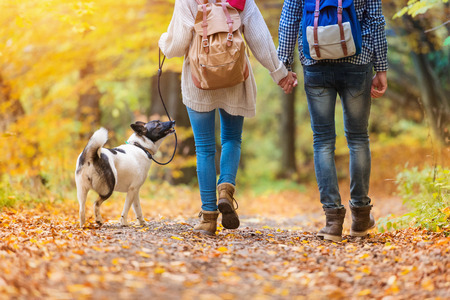 At Goldsmith Podiatry, we want to give our patients some tips to consider before you hit the trails to ensure greater comfort and protect your feet from injury. Preview the trail. A mile on a hiking trail can feel much longer and more strenuous than a mile in your neighborhood. Use a trail map to determine the length and degree of difficulty of a hike. Choose a hike that suits your current level of fitness. Do a boot check. As with any other sport or fitness activity, wearing the proper footwear is the number one step you can take to protect your feet. Check your boots over for signs of wear and tear and replace if they appear worn out. Good hiking boots should be sturdy, well-insulated and moisture proof. High tops provide excellent ankle support. A rugged tread will help you navigate uneven surfaces. Pack for protection. A few small items added to your backpack can significantly increase your comfort. Bring an extra pair of socks in case you need additional padding or if your feet start to sweat excessively. Damp feet inside of dark boots is a perfect recipe for a fungal infection. Moleskin can stop a blister from prematurely ending your hike. Apply to a spot that feels like it’s getting sore before the blister forms. Bring an elastic bandage and small first aid kit to treat any injuries that may occur until you can get safely back to civilization. Stay hydrated. Not only is this good advice overall, drinking plenty of fluids can help prevent painful swelling or edema in your feet and ankles. Listen to your feet. If you start to feel pain or fatigue in your feet, take a break. Pushing yourself is likely to result in injury. If you do twist an ankle or sustain another injury on your hike, be sure to get it evaluated by our podiatrists, Dr. Howard Goldsmith or Dr. Rosanna Troia as soon as possible. Contact our New York City office for an appointment at 212-877-1002.